Courtney Stodden was born on august 29, 1994, in Tacoma, Washington. She made her first step forward to fame as beauty pageant contestant in 2010. The youngest of three children, spoiled in childhood, but “in a good way”. Even though, Courtney was bullied and judged by her appearance and the way she looked, she continued her education by being home schooled through an online private Christian academy. Managed by her mum, Krista Keller, till 2015, she was gaining popularity as a singer, managed by Hutchinson nowadays, still does. I’m happy with the way that I look. Below I’ll list facial traits, in which I noticed changes. Are they just makeup tricks, aging changes or possible procedures? I’ll give my guess. Plump of lip shape, their volume up may be result of overcontouring lips or using other make up tricks. 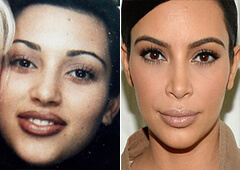 At the other hand, looking on before and after photos, the lower lip shape became more even and upper lip changes its shape, lips slightly gained volume, which could be result of correction by fillers or injections. In case if she undergone any cosmetic or plastic surgery, her lips still has its natural proportions, and don’t differentiate themselves from other face features. Courtney had a slight aquiline profile with a bump. Comparing before and after photos nostrils still have the same shape, but tip of her nose became more upturned now and bump moved away. Also, possible plastic surgery corrected Courtney’s tip-titled nose and made tinier the bridge of the nose. 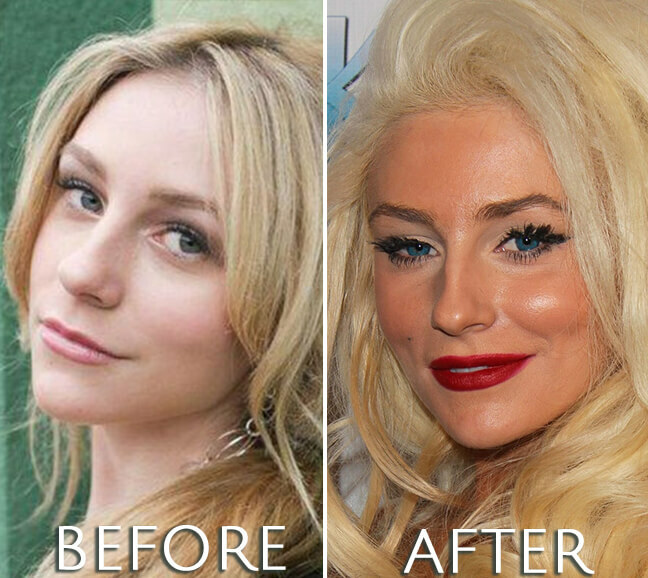 In some sources written that she confirmed the rhinoplasty, also, this accomplished procedure helded not for only aesthetical, but medical purposes like nasal blockage, sleep apnea, symptoms of nasal allergies. Courtney has natural diamond face shape. On some lately photos her cheek apples look plump, which accents her cheekbones. Also, chin became more pointed and chiseled. 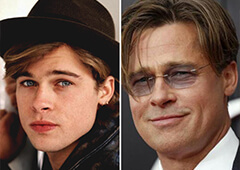 Those changes don’t look artificial, but natural, gives a yunger look, and possibly are temporary, such effect is likely after botox injections. Courtney’s pearly whites look superb, but comparing before and after photos, we may guess that they wasn’t gifted by nature that perfect. Looking on early photos the teeth shapes were uneven, some of front teeth were close-set and sticking out. Now we observe straight, pearl-like, even, perfect smile. Probably it’s the work of dentist. Specifically such effect gives the procedure of porcelain veneers. 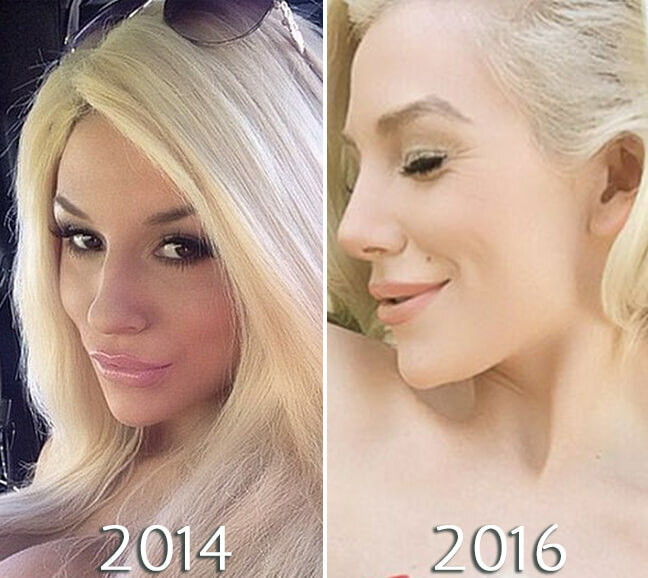 I think all aggression and rumors against Courtney Stodden, based mostly on her age and her plastic surgery obsession. But summing up all changes, there is no unnatural look or any signs of megalomania. All correcting procedures, if they was, completed her innate features. By the way, everyone should respect decisions of other people, especially if they make them happy. It is really hard to compare before and after photos, because before she had a very childish appearance, just as ordinary fifteen year olds. But now, Courtney aged up, completely changed her style to Marilyn Monroe look-a-like. 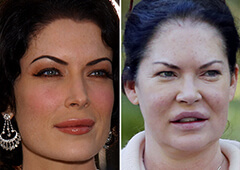 And we can only guess is it plastic surgery or that changes natural. In any case, I truly believe, she finds comfort with her nowaday appearance. I’m a confident girl, I’m happy. And honestly I think that’s all that matters – following your heart, looking the way you want to look, dress what you want to dress. As long as you aren’t hurting anybody else, I think you’re fine. The absolute truth told by Courtney Stodden.